Daniels Trading has made a name for itself providing guidance and establishing strong relationships with its commodities trading clients. Consistently adding new clients is pivotal to success, and the commodities market (like other industries) requires consultants to differentiate from competitors. To promote Daniels Trading’s expertise and proven track record of success online, Adam Nicholson, vice president of marketing, outsourced website content creation to Brafton. “We had a strong website, but from a content generation aspect, we weren’t doing enough to attract leads, and that’s initially why we started working with Brafton,” Nicholson said. The company’s website content drove substantial search traffic. Moreover, as part of the first service agreement with Brafton, Daniels Trading received integration with different social networks, so headlines from recent news articles would appear on Facebook and Twitter. 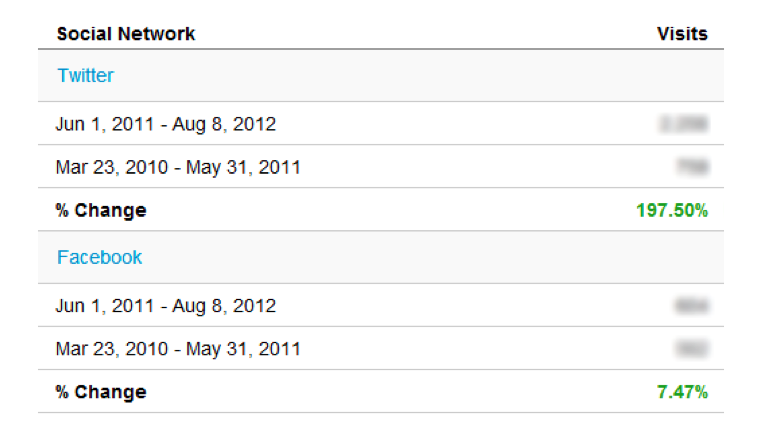 The content became an important social traffic driver for the company. With relevant headlines shared on social marketing platforms, Nicholson found that prospects and customers started reaching out to the company via social networks with questions about the commodities market. Daniels Trading was thrilled that website content sparked meaningful conversations, but Nicholson quickly learned he needed help to make his social efforts as successful as his website content marketing campaign. 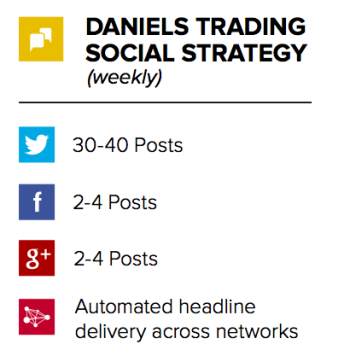 In addition to shared website headlines, Brafton gives Daniels Trading up to 150 custom Twitter updates per month, and an additional 30 updates combined between Google+ and Facebook. These updates sometimes involve shared website headlines, but none are automated: They are interactive social posts targeted at key online followers. Daniels Trading and Brafton worked together in the early stages to find the ideal brand voice and tone for social engagement. Nicholson initially had reservations about giving an agency a day-to-day role in Daniels Trading’s social voice. Nicholson said, “I monitored everything we were doing at the beginning.” He quickly grew confident in his Brafton team’s ability to personify his brand. At the start of Daniels Trading’s social marketing partnership with Brafton in June 2011, the company had around 1,000 followers on Twitter. By shifting from solely sharing website content to cultivating an active voice on the platform, Daniels’ follower base grew to more than 3,200 users within one year. 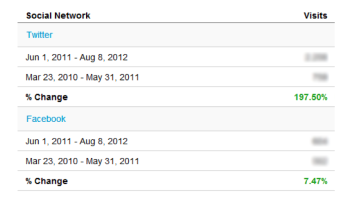 That’s more than 2,000 additional people reading social content and interacting with the brand. More importantly, the company found this growing follower base represented a highly relevant audience that clicked to its site. 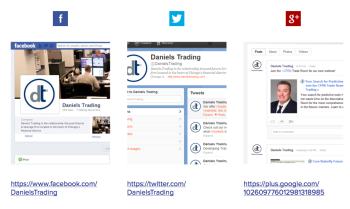 Daniels Trading’s Twitter referral traffic increased more than 197 percent in the first 14 months of interactive social posts. Facebook updates similarly helped increase Facebook-derived website traffic by more than 7 percent since Daniels Trading invested in custom posts for its social media presence. The success Nicholson has seen from social engagement as a tool for building long-term interactions with prospects has given him an evolved understanding of social ROI. That said, the updated social strategy has still fostered conversions for Daniels Trading, including webinar enrollment and form completions with information requests. Nicholson believes the interactive campaigns have contributed to the website’s overall conversion growth of more than 178 percent since moving to the advanced social strategy. 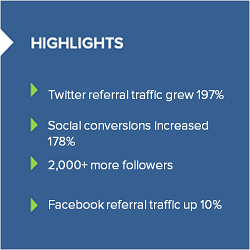 Moreover, analytics show that assisted social conversions rose by more than 65 percent in the 12 months ending August 2012 compared to the year prior. In total, the site has seen 250+ social conversions since launching its Brafton-enhanced social marketing campaign, earning the company thousands of dollars. What started as an industry-focused news content marketing campaign aimed at boosting search standing and leads became a comprehensive web marketing strategy that included active engagement with prospects and prominent industry voices.